First, here's some Italians mustering for a quick trip to North Africa and back. I've decided to use the three merchants to represent Santagata, Gioacchino Lauro (both of Achille Lauro), and Entella Mangiarotti (of Fu Gioconda & Enrico Ravano). The first and third ships were both conversions picked up second hand on e-Bay. They appear to use portions of an older style C in C tramp steamer. The second ship uses a Panzerschiffe Italian freighter. (And while I've had it a long time I did recently update it.) The three Soldati class destroyers are further longtime Panzerschiffe members of my collection. Next we have several German ships that have made their way across the Baltic to the Norwegian fjords. In the first photograph Dithmarschen keeps company with Scharnhorst. In the second Frigga (against the pier) and Oldenburg offload supplies under the watchful eye of destroyer Z-30. Dithmarschen is another Panzerschiffe casting sold as Nordmark. Oldenburg is from the same supplier's WWI range, where she can be bought as Möwe. I haven't as yet identified Frigga, but she feels like an older Viking Forge casting. The model is a little crude, but with some TLC it becomes quite useful. The general shape suggests an older prototype, likely coal fired. Frigga dates from 1924, so she's a little newer than I would have liked, but she's the right size, coal fired, and generally visually similar. In short, she'll do. 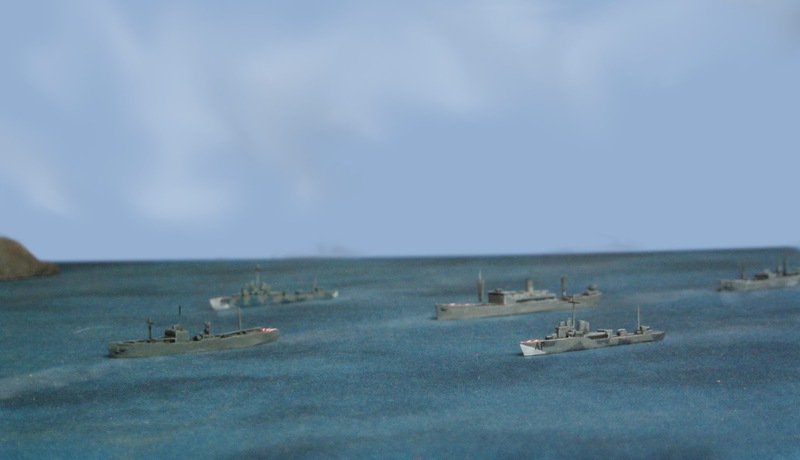 And of course all of these ships have since steamed off to the NIFTI fleet review, which will be depicted in full later, but there are more new recruits to introduce first. So as always, thank you for joining me and keep your eyes peeled. There's more to follow soon enough. Great pictures and beautiful ships! Great way to display your models. Personally, I enjoy the visual you've presented of how small a large sea going ship can appear while floating or sailing in a ginormous ocean. Nice work, Mr.C. Thank you Phil. Thank you Jay. You want to know what's funny? I usually have the miniatures spaced much much closer than would be considered wise just to try to get things into the same frame. Perspective really messes with shots. Views from above seem to create the impression that things are further apart and shots from closer to eye level can cause things to look more visually compressed. It's . . . surprisingly difficult. I alternate between thinking ships look lost and thinking they look like sardines in a small can. I'm glad when other folks like some of the compromises. Thank you. Always fascinating reading your posts. Thanks for the effort you put in. Thank you Aaron. It's a fun putting this stuff together, as you well know, and it's great finding that talented folks enjoy my small contribution to our passtime.